Angela Merkel, Chancellor of Germany, is the most powerful woman in the world. She has been the prime minister of Germany for almost ten years. Only Putin has led a major power longer. Compared to her, other major leaders lack longevity and experience. She speaks on the phone with Russian President Vladimir Putin once or twice a week. 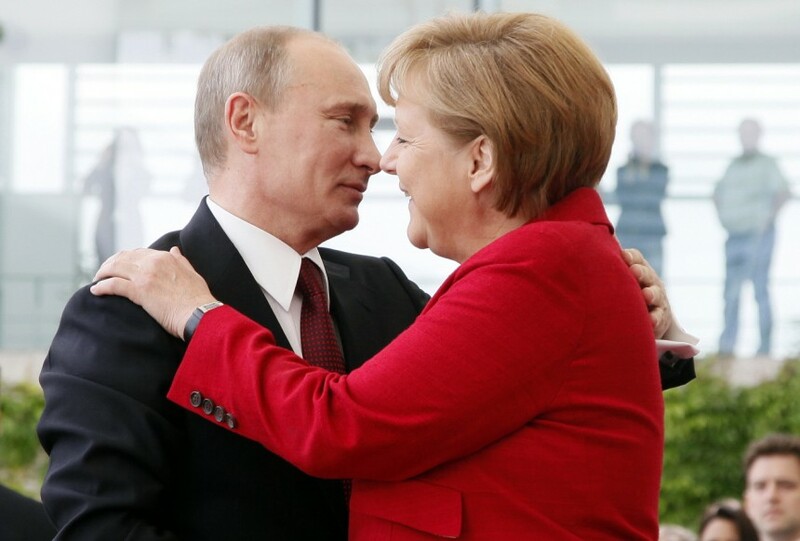 Putin speaks German while Merkel speaks Russian, though not as well as Putin’s German. She has talked with Putin more than Obama, Cameron, and (French President) Hollande combined. They remain two of the most popular leaders in the world – Putin’s approval rating has been as high as 90%, Merkel’s at 75%. On June 6th, the seventieth anniversary of D-Day, Merkel met with Obama, Cameron, Hollande and Putin, leaders of the four victorious allies. The supreme irony is that, almost seven decades after Germany’s defeat, Merkel was the star attraction, clearly leading the others. Everybody wanted to talk with her. She is able to dictate economic policy to the other 27 member nations of the European Union. She is deeply committed to European unity, believing that Europe makes Germany bigger. She is sometimes described as the Chancellor of Europe. Merkel’s refusal even to consider a British proposal to change EU migrant policy was a clear signal that she is willing to let the British go, to leave the EU. She is deeply committed to Israel. All except one of the above facts appears in a lengthy and fascinating article on the German Chancellor, “The Quiet German,” by George Packer, in the latest New Yorker magazine (December 1st). A great deal is changing in Europe and Merkel is at the center of the changes. Anti-Americanism in Germany is greater now than it has been for over thirty years. Barely half of Germans have a favorable view of the US, the lowest figure in Europe, except for Greece. Germans were deeply offended by revelations that the US was spying on their country, including listening in to the Chancellor’s private mobile phone calls. Additionally, the article reveals that at the height of the eurozone financial crisis, when Merkel repeatedly called the US President, he refused to answer or return the calls. Earlier this year, when Putin lied to Merkel, she refused to take his calls the following week, a way of showing her displeasure. The Russians panicked as Germany is the one country they cannot do without. Desperate to put things right, they reminded the Germans that if the two countries got together, like in 1939, they would be the greatest power in the world. Watch out, America – do not take German support for granted. Germany is in the drivers’ seat of the European Union, the world’s biggest single market. This is a very powerful and influential position to be in. If Germany distances itself from America, others will follow. The Book of Revelation shows that the world is going to witness a revived Roman Empire, with ten nations coming together to form the prophesied Beast-power. The only nation in Europe that is capable of leading these countries is Germany, geographically placed at the heart of the continent and the most powerful economy. The Old Testament prophetic Book of Daniel also shows us that this revived Roman Empire has a role to play in the nation of Israel, which makes Angela Merkel’s deep commitment to Israel of particular interest. It is doubtful that Merkel will be around long enough to be involved in the fulfillment of these verses, but the groundwork for future events is already being laid. Just today, there are rumors that the Obama Administration is going to place sanctions on Israel for its continued building of new homes on the West Bank and East Jerusalem. Relations with Israel have been strained. Those strains are worsening as Israelis turn to the right politically. An election is due next year. A reduced American commitment to Israel will leave the latter looking for alternative international backing. Some European countries are in the process of recognizing Palestine as an independent state, which will put further pressure on Israel. Europe is playing an increasing role in the Middle East. Look for more European involvement in the region, led by Germany.